ProGo is a natural and highly functional protein Isolate made from marine sources. It is extracted through a natural process so that functional and nutritional properties are preserved. It is then hydrolyzed so that it contains oligopeptides and peptides with a molecular weight of less than 3000 Daltons. Also, 50% of the peptides have a molecular weight of less than 1000 Daltons. ProGo has a favorable amino acid profile and is particularly rich in Methionine, Histidine and Arginine. It has also been shown in animal studies to improve iron absorption. The nutritional assets of ProGo are its richness in essential amino acids, the absence of gluten, lactose and cholesterol, and its lack of anti-nutritional elements. These aspects are very beneficial when trying to create healthy and balanced products. 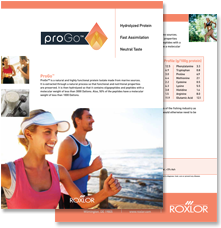 ProGo also has a neutral taste and is easy to work with in formulations. ProGo is responsibly and renewably sourced. Because it uses byproducts of the fishing industry as its source, ProGo has a positive effect in the environment as its source would otherwise need to be disposed of as waste.